Radiotherapy uses high doses of radiation- such as those from x-rays, gamma rays, or other particles to stop or slow the growth of tumours. Stereotactic radiotherapy uses radiation delivered with the goal of submillimeter accuracy in order to maximize the dose of radiation given to a tumour without damaging the surrounding tissues. In order to do this, very exact patient positioning and treatment delivery is necessary. 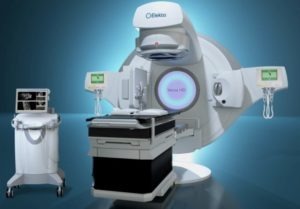 Using imaging scans, a team of doctors including a neurosurgeon, neurotologist and radiation oncologist work together with a radiation physicist to pinpoint the position of the tumours and plan exactly how to treat it, keeping in mind the vital structures near the tumour which must be avoided. All types of stereotactic radiotherapy work in a similar manner, in that specialized equipment is used to focus many small beams of radiation on a tumor. Each beam has very little effect on the tissue it passes through but a high dose is delivered to the site where all the beams intersect. When is stereotactic radiotherapy used to treat acoustic neuromas? Acoustic neuromas can be managed in one of 3 ways: surgical excision, stereotactic radiotherapy, or careful serial observation. The best treatment for each patient depends on factors such as patient age and fitness, symptom burden, size of the tumour, growth of the tumour, and patient preference. The goal of stereotactic radiotherapy in the treatment of acoustic neuromas is to stop the growth of the tumour, preserve the function of the facial nerve, and attempt to preserve hearing. It is most commonly used to treat patients with small symptomatic acoustic neuromas, recurrent acoustic neuromas, and those patients who are unfit for surgery or refuse surgery. Will stereotactic radiotherapy get rid of an acoustic neuroma? The goal of stereotactic radiotherapy is to stop the growth of the tumour, or in some cases make it shrink. Radiosurgery does not get rid of the tumour. What is the difference between stereotactic radiotherapy and radiosurgery? Stereotactic radiosurgery gives the full dose of radiation in one session (or fraction). Although it is called radiosurgery, this is a misnomer and there is no operation involved. Stereotactic radiotherapy uses up to five fractions. The advantage of fractionating the treatment (dividing the treatment into sessions and giving a proportion of the total dose at each session) is that it allows higher doses to be delivered to the tumour and gives the normal surrounding tissue time to repair in between treatments. This is possible because normal brain tissue can repair better between treatments than tumour tissue. What methods are used to deliver stereotactic radiation and what are the differences between these methods? Gamma Knife stereotactic radiosurgery: A metal helmet/frame is fixated to the patients skull under local anaesthetic. The tumour is treated using focused beams of gamma radiation via pinholes in the helmet. The treatment is usually delivered in 1 fraction. Linac based stereotactic radiotherapy: No frame is required. The patient is kept in position using a tight fitting thermoplastic cast and a linear accelerator rotates around the patients head, delivering photon radiation in an arc. The treatment is usually delivered in 3-5 fractions. Proton beam therapy- No frame is required. The patient is positioned in the same way as in Linac-based treatment. However, instead of a Linear accelerator being used, a machine called a cyclotron is used to deliver heavy charged particles called protons. Proton beam therapy is not available in South Africa. Which of these methods of radiotherapy is the best? Studies have investigated outcomes for each of these three modalities, analyzing tumour control, rates of hearing preservation, rates of cranial nerve preservation, and complication rates. Outcomes for Linac based stereotactic radiotherapy and Gamma knife radiosurgery when used to treat acoustic neuromas have been the same in these series (tumour control of 100-85% in Linac based series and 100-71% in GK based series). There is no evidence that one is superior to the other. Younger patients and patients with higher auditory function prior to radiotherapy have the best chance of hearing preservation. What are the benefits of stereotactic radiotherapy ? The treatment is quick and pain free. It involves no surgical procedure, therefor no anaesthesia and no risk of infections. It is done as an outpatient and involves no hospital stay. There are minimal physical effects, therefor there should be no loss of working hours and in most instances no considerable rehabilitation time. Will I feel any pain during treatment and what side effects can I expect? Stereotactic radiotherapy is pain free. Depending on the position and the size of the tumour, side effects whilst on treatment may include dizziness, nausea, and headaches. These symptoms usually only last a short time and can be managed with medication. Will radiotherapy improve my tinnitus and dizziness? These symptoms show variable outcomes after stereotactic radiotherapy. The majority of patients who present with small tumours and tinnitus experience an improvement in their tinnitus. However, a small percentage of patients who do not have tinnitus prior to treatment develop tinnitus. This is often transient. Radiotherapy does not usually improve dizziness and in a small percentage of cases it can cause dizziness. In most cases this is also transient. What follow-up is required after stereotactic radiotherapy? You will be seen by your oncologist six weekly after the completion of your treatment then six monthly for the first year, and yearly thereafter. In addition to this you will continue to see your otoneurologist.